The only history of China for me. For my purposes (steppe study) - he is no less than fantastic on the frontier states or conquest dynasties... right up until the Mongols. I felt let down in that section, and much prefer The Cambridge History of China, Volume 6: Alien Regimes and Border States, 907-1368 as a look at the Mongols in China. Of course the Cambridge has more detail on its period, and after the Cambridge, Mote seems interpretive: you have his views. However, he still gets five stars for Liao, Jurchen and the book in general - yes, even the Chinese stuff. In fact the latter is great; gives you much on the mental life or philosophy and the changes thereof (not in a dull way). For a thousand-page-book, comes close to unputdownable. 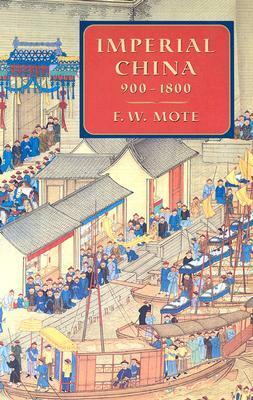 Sign into Goodreads to see if any of your friends have read Imperial China 900-1800.